Don Hickey Used Cars & Trucks is one of the best buy here pay here used car and truck dealers in Oklahoma City. 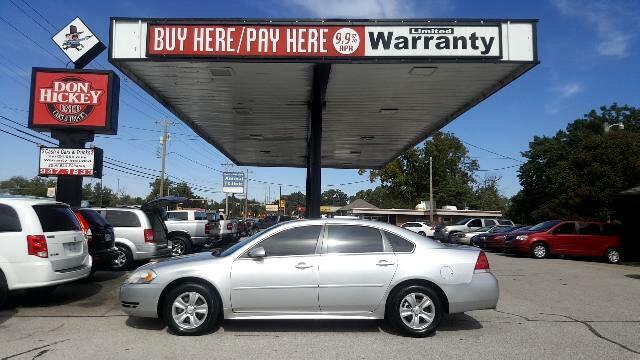 We have been family owned and in business for over 30 years with a solid reputation to back us up, from The Better Business Bureau, to reviews on Google ( https://goo.gl/maps/Vm9NCvGzqRq ), to reviews on Facebook ( https://www.facebook.com/pg/donhickeyusedcars/reviews/?ref=page_internal ), or the many people around town , with over have our business coming from referrals. We back you up with a 2 year / 24,000 mile warranty, free oil changes, and a low 9.9 APR interest rate for everyone, does not go up or down. Bad credit, good credit, all credit is welcome here. Message: Thought you might be interested in this 2013 Chevrolet Impala.